Michael Corvin (Scott Speedman) is an unlucky human doctor being stalked by Lycans (i.e. werewolves) through the streets of Budapest. As he’s about to board a train in the Metro, he’s caught in a shootout between said Lycans and a team of vampire “Death Dealers” led by Selene (Kate Beckinsale). It seems the Lycans and vampires have been at war for a thousand years, but lately the former have gotten more aggressive. Determined to find out why they’re after Michael, Selene finds herself drawn to the human herself as she works to uncover the Lycans’ sinister plans. Underworld is an interesting film. It’s not a particularly good one, but it’s not terrible either. The worldbuilding here seems well thought-out, but the acting is wildly uneven. Beckinsale and supporting players Bill Nighy and Michael Sheen are all good, but Speedman and Shane Brolly are decidedly not. The film’s plot also feels like a derivative and Goth-infused mash-up of the age-old werewolf vs. vampire trope, mixed with the bullets and leather stylings of The Matrix (as it happens, Underworld’s 2003 theatrical release was sandwiched by the two Matrix sequels). That’s not a bad thing in and of itself, but having these two ancient mythological races fight their battles with pedestrian guns and ammo seems decidedly unimaginative. 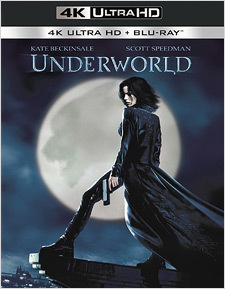 Underworld was shot on 35mm film, so Sony presents it here in a full 4K scan in the original 2.39:1 theatrical aspect ratio, and with a new High Dynamic Range color timing pass. It should be noted that the 4K disc includes the R-rated Theatrical Cut. As you’d expect with film-based material, the blacks will tend to look a little bit crushed and lacking in detail compared to digitally-shot footage but, that aside, this is a lovely image. Shadows are bold and deep. Highlights are bright but natural looking. There’s abundant detail and refined texturing. Colors are rich but stylized toward cool blues and grays. Grain levels are modest and consistent throughout. Frankly, it’s hard to imagine the film looking better than this. Audio-wise, the new English Dolby Atmos mix is quite good and represents a major upgrade over the original Blu-ray edition’s uncompressed PCM 5.1 sound. The track presents a wide front soundstage, with highly active and atmospheric surrounds, and terrific LFE support. The height channels engage often, noticeable from the moment Selene drops from her lofty perch during the film’s opening sequence. Panning is smooth and precise, and overall clarity is excellent. Additional audio is available in French and Italian 5.1 DTS-HD Master Audio, with optional subtitles included in English, English SDH, French, and Italian. In the end, the best that can probably be said about Underworld is that it’s perfect guilty pleasure material. If you love this film, you’ve certainly never experienced it in this kind of quality before. Sony’s 4K Ultra HD Blu-ray is terrific. If this is representative of the kind of A/V quality we can expect from similar film-based catalog fare on the format, bring it on.